When people find out I double majored in History and English, they assume I know all there is to know about past world events and the correct way to use effect and affect. I am then forced to remind them that history is a pretty big subject and than no one knows how to use those words correctly. Then I hand them their fries and move on to the next customer. 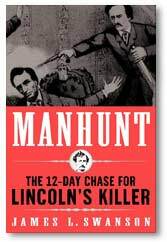 In attempt to bring important, fascinating historical events to the general public, James L. Swanson gives us Manhunt: The 12-Day Chase for Lincoln’s Killer. While everyone knows the basics, I’d wager that most people haven’t given such a monumental incident in American history much thought. Of course, I say that because I was one of those people content to know that Abraham Lincoln was shot by John Wilkes Booth in Ford’s Theater, but that’s beside the point. This exhaustively researched account has something for everyone: There are action scenes, as when one of Booth’s accomplices tries unsuccessfully to assassinate another target. There are character studies of Booth and the people who helped him on his way. There are flat out crazy people to point and laugh at, like the man who ultimately ends the standoff between Booth and his pursuers. The details surrounding the assassination are especially shocking when viewed through today’s lens. In the span of eight hours, Booth conceived of and prepared for his plan and enlisted the help of several conspirators. Most people can’t decide what to have for lunch in less than 90 minutes these days. But I digress. Swanson’s book truly is the treasure other reviews would have you believe it is. Readers get the full picture here: how Lincoln was feeling about the end of the Civil War; the resentment felt by a great deal of Southerners; the details behind just how such an audacious act was pulled off; and the hardships that came with coordinating a nationwide search in the age of the telegraph. I enjoyed my time reading Manhunt and found myself staying up late to read, something I don’t normally find happens when I read history texts. Since I was ignorant of the details surrounding the manhunt, I found something on each page that I could marvel at. There were plenty of times I nudged my dozing wife to say, “Honey, listen to how crazy this is!” so I’m sure she was happy when I finished the book. In a word: no. No we can’t surmise. No we can’t speculate. And no, we can’t ever know. And that’s fine. Rational, intelligent people are fully aware that there are moments of history we won’t be privy to. There’s no need to fill in the gaps with what amounts to historical gossip. It got so bad, and I got so irritated, that I started skipping those sections completely, not even skimming them like I did when I first encountered these wastes of pages. On the whole, however, I found Manhunt to be an engaging read that wasn’t hard to get through (as many historical books can be). I liked my time spent reading, and I came away feeling better about myself since I actually learned a thing or two. This entry was posted on June 12, 2008 at 12:00 pm and is filed under Uncategorized. You can follow any responses to this entry through the RSS 2.0 feed. You can leave a response, or trackback from your own site. That said, is this in the narrative history vein of someone like Mark Bowden? — clearly the standard for reproducing conversations sounds quite different. I have liked the turn to a more novelized narrative form in lay history texts. Perhaps b/c that is what I am more familiar with. McDonald’s serves coffee now, fool! I’d put Bowden above Swanson, but they are similar. Manhunt often reads like a novel, but with the aforementioned liberties taken that drove me nuts. Your mileage may vary, of course, but that didn’t stop me from enjoying the book. I will add thta Swanson can get carried away with his research/bogged down in details I cared not a wit about.